* Please keep in mind that this is a game still in development and all components are in prototype form and can be changed at the designer and publisher’s discretion. 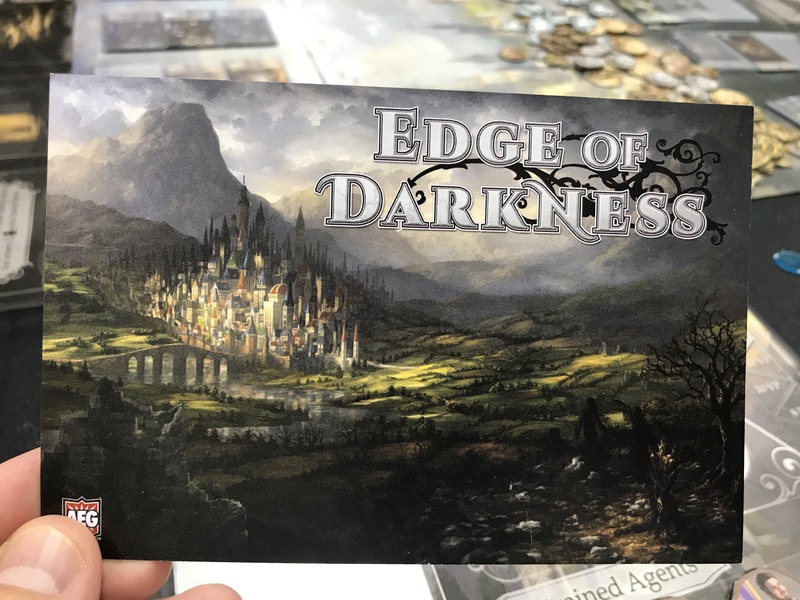 Edge of Darkness is an upcoming Kickstarter game with the card crafting mechanism expanding upon Mystic Vale. Each player takes the role of the leader of a guild trying to become a leader of the City. Players will enhance their cards “followers” to unlock special abilities with agents. The guild with the most power at the end of the game is the new Leader. The game has a base mechanism, that John D. Clair is known for, card crafting which debuted with Mystic Vale in 2016. Each player will have a deck of cards with a follower in them, and through out the game will add other clear cards to them to make them more powerful. Once a player uses one of his cards it gets discarded, not in his own discard pile, but the group discard pile. Meaning the good cards that you create can be used by other players. When you use the card of another player, instead of getting discarded it goes back to that player for them to use on their turn. When a player plays a card much of the time it is to get resources….gold or to take actions such as to put agents in specific buildings of the city. There will be different buildings each game, which will make for a lot of different strategies and interactions. Agents are important to allow players to take the really good actions. Agents allow you to build defenses, get more of your own aligned cards in the deck, draw and use more cards and attack outside threats. There are three outside threats at all times through out the game. These threats are basically marauding monsters out to wreak havoc. At the beginning of a player’s turn they recruit up to 3 cards to use during their turn. It could be one of their own cards, or someone else’s. When you are done recruiting cards, you will draw a number of cubes from a bag based on the cubes shown on the used cards and drop them in the cube tower. The cube tower represents the threats that are coming upon the city. If you have the most cubes on an enemy they will attack you. Once 8 cubes are on a specific enemy it will cause them to attack. Players will continue to take actions for 8 rounds and the player with the most power at the end of the game will be the winner. Lots of interesting ideas…..creating better cards for yourself but knowing others can use them is really interesting. The cube tower and the timer of attacking threats is really cool, though I am not sure it is fully random. If you throw all your cubes to one side chances of them going out that same side is high, though this was a very early prototype of the cube tower. Replayability….with all the card crafting systems this is one of the high points. So many combinations to explore. Especially with the buildings being varied each game. Every game you will use 10 buildings and the designer had said there will be around 20-30 different buildings when the game releases. Kinda confusing and clunky. It takes you kind of a while to understand how everything works. The part that you play your cards and send agents to different buildings is confusing. Then it isn’t always clear on when and how to use those agents. Iconography is not great and the size of the writing and symbols is very small. Some of the iconography, like the ones that tell you to put an agent out or pick an agent up, were hard to get and understand for a while. After a couple plays it would be fine but with new players it would be an issue. Different buildings each game may take too long to figure out strategies. This is weird because the buildings were part of my positive but this is an issue for me as well. If you get a game that can’t attack the threats it would change the game drastically….not a bad thing but trying to figure out the strategy when you are used to that mechanism being there, would be a drag. I am going to keep my eye on this one. It didn’t knock my socks off but I didn’t hate it either. I like some of the things it is trying to do and want to explore it more….but something was just off about it. I didn’t feel like I had as much control over my cards as I do in Mystic Vale and that kinda weirded me out. Not sure I will back this on Kickstarter or not….this is a tough one. Next Next post: Best 3 Games with…Fighter Jets! Thanks for the review. Does sound a bit clunky to me though I have never given it a try. At first it is appealing but sounds a bit confusing and hard to get a group of people interested in to me. Your review is very helpful. Glad I can help…..it has good ideas, just doesn’t mesh well. Hey Tim. Thanks for the write up. 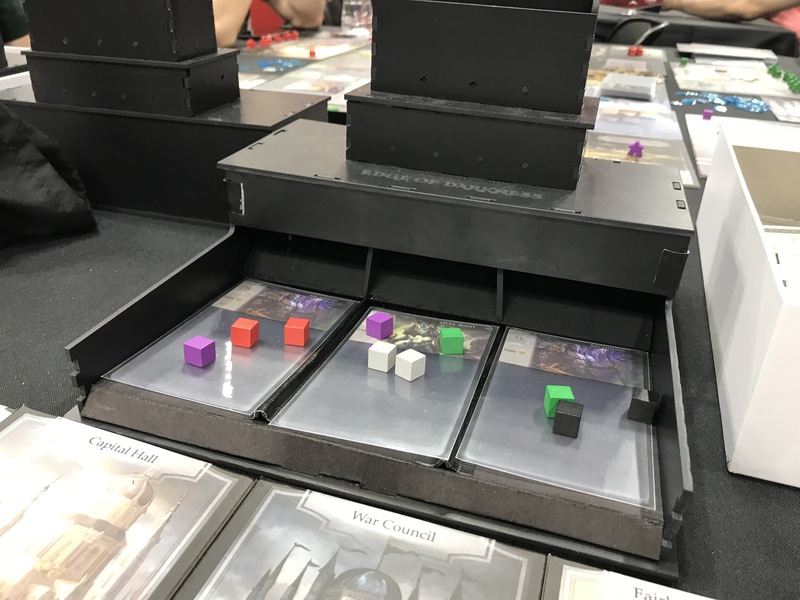 Couple quick notes: You’re totally right that you could cheat with the cube tower that we had at GenCon by throwing the cubes in one side or the other. That tower was super prototypy though, and the final version will fix that issue. Also, I totally agree the icons on the prototype cards are way too small and hard to read. Makes an already complex game harder on a new player. I’ve already communicated with the graphic artist how I want those changed and enlarged. Finally, our random setup rules for choosing advancements/locations will be “controlled” randomization, meaning certain essential effects will always be included, there are just alternate versions of them. For example, you will always have some version of an effect that allows you to train new agents. Thanks again for you opinions! Hey John!! It was awesome to meet you at GenCon and have you teach us the game. Thanks for the heads up and yes, I should have mentioned that the Cube Tower was a very early build as you let me know when I was taking pictures of it, i will edit. The cube tower really is great. I love the tension of seeing all the cubes that will be added and hoping you can kill a threat before it has a chance to attack you. That is great to hear about the buildings. It will be interesting to see how you are able to balance the random set up. On one hand I like the idea of a game being about resources as you just try to stay alive with the treats. But kinda want to be able to defend myself and attack also. It’s a good thing I don’t have to make those decisions. Sounds like you had some of the same concerns that I had and are already a step ahead. Congratulations on the success and I will keep my eye out on Edge of Darkness! Thanks Tim! Yeah, Edge is a tricky game because there is a lot for a new player to intake up front. It’s also sort of a deckbuilder and sort of a worker placement game, but doesn’t work anything like other games in those categories, so new players don’t have helpful reference points from other games to ground their understanding and strategy. Feedback like yours makes me think we may want to include a 2nd rule book with a “first 3 rounds walk though”, that includes some basic strategy commentary and tips. I have experienced playtesters tell me it’s simple, but some new players say it’s confusing. Key for us is to figure out how to help people over that hump. Thanks again for the helpful comments!